Just discovered China Daily’s wonderful treasure trove, Newscartoon site. Trying to puzzle through cartoon dialogue is a pleasurable challenge for me (Jason, however, seems to have no trouble!) — and it’s a really different way to understand what’s important in China at the moment, and how current events are being interpreted, at least from an official point of view. The site also includes links to homepages of many of its cartoonists. And at the very bottom of the site you’ll find links to dozens of other cartoon, Flash, and animation sites. Enjoy! 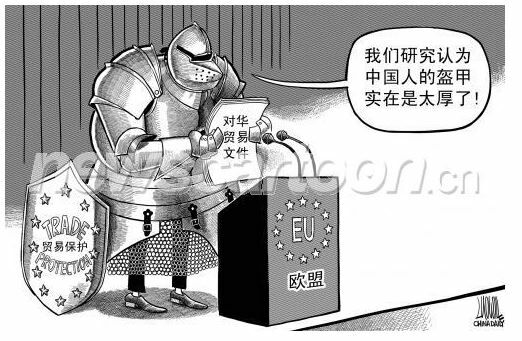 “Our research reveals that Chinese armor is just too thick!” [Document he’s holding reads: Document on Trade with China] See artist Luo Jie’s other works. 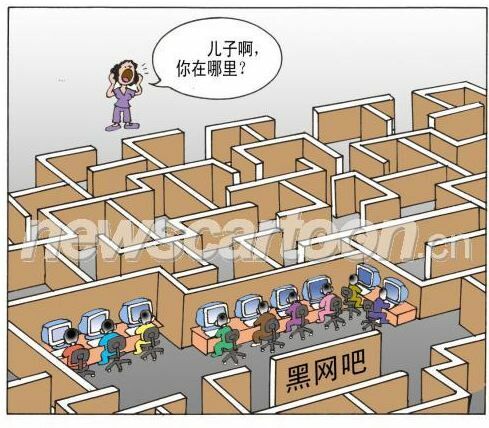 “Son, where are you?” [SIGN ON WALL: BLACK NETBAR, i.e., illegal Internet cafe] By Ma Jiancheng. Hi. I just published a book of political comics, essays, and poetry about US and China’s “false dichotomy” of a relationship.